The Sydney Rock Oyster (Commercial Oyster) is the most ecologically and commercially important species of the oyster family (Ostreidae) from Australian waters. In the wild it dominates sheltered shorelines in the intertidal and immediate subtidal regions along the eastern Australian coast and also forms the basis of extensive oyster leases, especially in South-east Queensland and northern New South Wales. It grows to a length of over 100mm, sometimes much larger under cultivation conditions. This is the oyster much-prized by restaurants for its superior flavour and texture to that of the Pacific Oyster (Crassostrea gigas). The latter species however - although also farmed commercially - has the ability for its larvae to out-compete the Sydney Rock Oyster for settlement space, and hence is viewed as somewhat of a pest species by certain farmers focussing on S. glomerata. Sydney Rock Oyster shells, understandably, feature prominently in the list of mollusc species from Aboriginal shell middens. 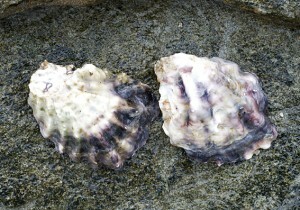 The species is subject to predation by carnivorous snails such as the Mulberry Whelk and Oyster Drill, and oyster leases are sometimes seriously affected by outbreaks of QX disease – a wasting disease brought on by oyster infection by the microscopic protozoan parasite Martelia sydneyi (see PARASITES). South Pacific: East coast of Australia, New Zealand.